squirrels, or other wild animals, we have the food and accessories you are searching for. 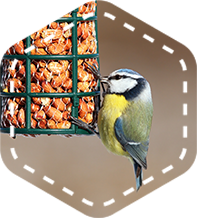 We have a large selection of feeders that are made locally or procured from one of our neighbors here in Anderson Township whose family is a distributor for all the major lines of Bird Feeders and Supplies. We believe in what goes around, comes around and by doing business within our community good things come around quicker. We hope you do too! Gardman, Heath and Woodstream. We also carry a few hand made feeders.